Our Johnson Hall overlords have been requiring this un-scientific training for all faculty who want to serve on search committees. I did it – not that there was a choice – and I got the follow-up survey today from our Vice Provost of Equity & Inclusion. See email below. Thank you for attending an “Understanding and Addressing Implicit Bias” workshop this fall. You are receiving this message based on our registration records. We hope to capture the opinions of the campus community on this workshop and greatly appreciate your time in answering a few questions at the link below. We anticipate the survey will take 5-10 minutes to complete. Your response by January 12, 2018 is greatly appreciated. The survey is confidential, responses will be looked at in an aggregate way with no link between response and responder. When Yvette Alex-Assensoh arrived at Oregon, she came to one of our department meetings. One of her points of emphasis that really stayed with me was that she wanted to instill an ethos where diversity, equity, and inclusion are seen as relevant to everything we do and therefore everyone’s responsibility. While dedicated people and offices are important, we can’t always just shunt these issues off to some division or committee tasked with them. In line with that, my comments were not intended as a targeted criticism of the VPEI’s office. For the issues I raised, there is plenty of responsibility to go around: it starts with the President, the Provost, and on down. Partner hiring, childcare and family leave, compensation for diversity work, and everything else… These things require a commitment of central resources to address. They are budgetary and policy issues related to our ability to make competitive offers and offer attractive working conditions to diverse faculty, not matters of bias on search committees. As far as the workshop itself, implicit bias is an active area of basic research and there is a range of views on it within the field. I do not believe the evidence supports a leap from basic research to intervention, since many test of implicit bias interventions have failed to show evidence of efficacy or effectiveness. But there was some good stuff in the workshop too, including some of the research that was presented and some of the recommendations for good search committee processes (neither of which is necessarily about implicit bias). I don’t have a problem with having some kind of workshop or other support to help search committees develop good processes. But that cannot substitute for a serious commitment of resources to diversifying our faculty. I also had high hopes for VPEI Alex-Assensoh when she was hired from Indiana. See my posts here: http://uomatters.com/tag/yvette-alex-assensoh. I wish her well in her job search, and I hope that UO can replace her with someone who is focused on outcomes, not window-dressing. I think you know of the strong affection I have for you and my general support for the work you do exposing malfeasance and absurdities within our institution. However, I think Sanjay just undermined quite elegantly your attempt to use his justified concerns with a particular aspect of our diversity aspirations in service of your periodic obsessions with individuals. I recall your numerous and wholly ignoble maligning of my late colleague, Jim O’Fallon. Shameful! I have more to say but it seems I have run out of space. Re comment #1–the definition of “implicit”: I should think “implicit” means not aware of at the time, not–incapable of being aware of, ever. I think coming to self-awareness, about racism or anything else, means coming to recognize the implicit biases of one’s past attitudes or actions. So of course I can comment on my own implicit biases, and continue to look for them. The survey question asked respondents to provide a specific example of implicit bias from their day-to-day lives. We do not have good, direct access to our implicit processes. In principle we might be able to indirectly infer them from our own or others’ behavior if they had strong and consistent enough effects. But the evidence does not show that they have those kinds of effects. We would expect one of the strongest effects of implicit bias on behavior to be on responses to a standardized assessment like the IAT. Yet even the IAT’s creators do not consider it to be a reliable way to infer the test-taker’s biases. The IAT website includes a statement to that effect. (So did the workshop.) At best it can be used to study aggregate patterns in large samples of people. Actual discriminatory behaviors are even harder to attribute to implicit bias than a standardized assessment. And even in the aggregate, the IAT does a very modest job of predicting discriminatory behaviors. Inviting people to reflect on patterns in their experiences and observations would have been fine. But asking them to provide an example assumes a level of certainty that no one can have. And it communicates the wrong message about how directly and consistently implicit biases are manifested in behavior, even under a favorable reading of the science. There is a smart and engaging short (<20 min) video about understanding and addressing gender bias in the workplace. Many of the research-based findings and solutions presented in the video also apply for other-than-gender-based bias. I highly recommend the video as a model of efficient and constructive ways we can educate ourselves about how to combat bias. I’m confused. 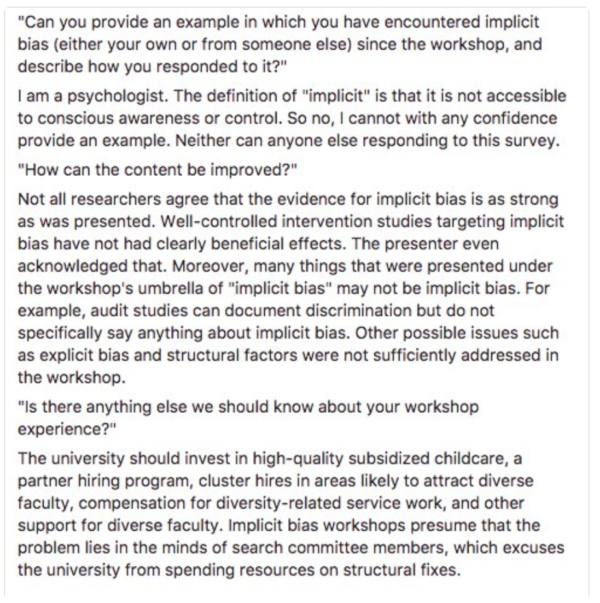 It seems like Sanjay is accusing UO of pushing implicit bias workshops as substitutes for other diversity-related policies. But don’t we have all those other things too? There’s dual-career, stop-the-clock, and mentoring programs (but I am onboard with need for better daycare – rumored the Senate is looking into that?). I’ve also seen some impressive startup packages, although we always want to offer more. Seems like UO is trying to do a lot with policies and related resources. I thought the implicit bias stuff was complementary to the cause, not taking away from it. People tell me the implicit bias training was a crock of worthless and ineffective attempted mind control. Personally, I find it amusing to see UO working itself into a fit over “diversity.” Especially considerations of budget. Yes, your departments are being taxed to pay for this stuff. No, the football team is not going to pay it for you. No, Matthew Halls is not coming back, the diversity police already ran him out. No, the students are apparently not going to pay it with ever more exorbitant tuition increases. Enjoy your bed! The UO administration is now requiring all search committee members to take a two-hour training on implicit bias. I did an abbreviated version at a BOT meeting last year, and I’m at one of the three long versions right now, with about 60 other faculty and administrators. The presenter, Erik Girvan (Law), who gives these talks often, starts this one off by acknowledging that there is lots of empirical evidence showing that these trainings do not affect implicit bias, or actual behavior. So I guess we’re just here to check a box – or for the talk, which is an interesting mix of advocacy and science. I agree. It’s tough to mix science and advocacy without going off the rails in one direction or another – particularly when you’re being paid to present a particular argument, and the audience has been ordered to attend and pay with their time. (I’ll guess that, including the opportunity cost of attendee time, these trainings cost UO about $75,000.) Erik did a good job despite this. There was plenty I’d argue about – i.e. the casual use of “bias” when talking about conditional means which are by definition unbiased estimates, the general over-emphasis on the implicit association test, and starting with the shades-of-gray visual illusion, which is too obvious an attempt to manipulate people into agreeing they must be biased about race too. But it did grab people’s attention. I thought the most powerful part was the behavioral results from the randomized resume and email response surveys, which show pervasive racist behavior in decisions that are clearly related to actual mentoring and employment situations. My understanding is that people’s racist employment decisions are generally not correlated with their IAT results. That said I think Erik successfully used the IAT as a useful teaching tool, in part because it opens people up to thinking about their own biases, and maybe about their own behavior, in a safe, non-threatening way. I can see why administrators love it, regardless of the validity of the science. uom: Am inclined to agree with you about using the money where it would directly help, scholarships for low ses students. Without regard to race. Instead of blowing more on programs that don’t work well and are terribly divisive to boot. I believe the current diversity programs are largely motivated — perhaps implicitly! — by desire of admin to (1) stay out of trouble and (2) exercise control over faculty, who by and large don’t like this stuff all that well when left on their own. Sanjay, Yvette, and Ib are right – this isn’t about one person, one office, or one committee. We need an institution-level commitment to make structural changes to promote equity and inclusion. To that end, it is worth noting the UO is already taking many of the steps that Sanjay suggests would have a more meaningful impact. We have subsidized childcare. A partner hiring program is part of the new Institutional Hiring Plan, and the IHP specifically names diversity as a main criteria for evaluation of proposals (https://provost.uoregon.edu/ay2018-19-institutional-hiring-plan). There are funds available for faculty diversity (https://inclusion.uoregon.edu/content/initiative-faculty-diversity-ifd). We recently had a cluster hire (of sorts) of African American faculty in CAS. Diversity is one of the main metrics that will be used to evaluate departments in the resource allocation process. I have seen diversity and inclusion be considered very seriously and change the outcome of departmental, college, and central level decisions. Nobody is under the illusion that the list above is sufficient, and we all want more resources dedicated to equity and inclusion. Money is necessary but scarce and not sufficient on its own. So as we keep pushing for actual dollars to be dedicated to this, we should recognize that other types of resources – namely, our time – are necessary, too. Many of the initiatives above were student- or faculty-driven. To me, that signals that shared governance is working in this area insofar as people who have new ideas and are willing to work to make changes can have meaningful impact at the institutional level. This isn’t a we-ask-they-do situation, nor is it an us-versus-them one. As Ib and Sanjay note, we all can work together to keep making changes for the better. I’ll also note that many of the initiatives listed above are relatively new, so it remains to be seen whether they’ll make a difference. Some factors, including substantial chunks of the budget and the sociocultural climate of Eugene and Oregon, remain largely out of our control. But they’re a great start, and a very noticeable change since I arrived in 2010. Any sensible effort to address diversity should start with some data showing what the problem is. On the student side, UO’s diversity problem is about economic diversity. While the proportion of undergrad students of color has increased from 15% to 28% over the past 10 years, the proportion of our students that are low SES (i.e. Pell grant eligible) peaked at 26% in 2011 and was 25% last year. See http://ir.uoregon.edu/school_college_profile. (The exception is Native American undergrads, where enrollment has dropped 50%). There’s no mystery about how you increase economic diversity (which of course is highly correlated with racial and ethnic diversity) – you spend more money on programs like Pathway Oregon so that it can also cover students’ living expenses, and more money on programs like SAIL, to get those students college ready. All the money that has been and is being spent on DEI administrative bloat and feel-good IDEAL plans and DAP communication strategies is money that is not available for programs with proven empirical track records. When it comes to faculty, the best data is UO’s Affirmative Action report at https://aaeo.uoregon.edu/sites/aaeo1.uoregon.edu/files/2017-18_women_min_aap.pdf. With a few exceptions, (CAS Science, e.g.) UO’s TTF are broadly representative of the available pool of PhD’s on the national job market, with respect to both gender and race/ethnicity. There just aren’t very many minority PhD’s in the pool (and, for some fields, not many women.) Obviously this is a pipeline problem. I saw some pipeline efforts for increasing grad school enrollment among minorities and women in the Diversity Action Plans, but in general the DAP plans focus on faculty, not students. Agreed. I was focusing on faculty, but we do have funds for increasing diversity in our doctoral programs through the grad school (e.g., Promising Scholar Awards). Some CAS departments take even more steps such as actively recruiting at minority-focused events at academic conferences. And there are funds available for that, too. Meanwhile, racism and sexism is rampant for the classified staff, not mentioned in any of these comments. HR & AAEO worse than useless. Agreed – pipeline programs are always critical and always need to be maintained, and there are indeed already a whole lot of existing programs especially in the sciences that have and need continued and amplified support. The faculty doing that work also need support. The climate in their departments also needs attention. Students see ‘the top’ when they’re in grad school. If it doesn’t look good, they’re not going to aim for it. Pipelines at least in the sciences are very leaky. Lots of work on the front end, but not sure the faculty search pool makeups have changed much. I admire my colleagues here for trying. And especially you Bill for your conviction. I caution, however, that the economist in you tends to reduce complex forces and experiences into numbers. It is both the promise and hubris of modern liberalism that we can solve social problems with science, policies, and programs. Yet, without intending to, you devalue the meaningfulness of the project that the VPEI and her team are engaged in. Everything we do is a bet against chance! All efforts are, from certain perspectives, wasteful, inefficient, etc. We learn as we persist. I am perhaps the longest tenured black professor on campus. (Of course, as you will attest, I don’t look it.) Can I get you to appreciate what it is like, after 27 years, to see more than one or two black professors hired to replace the one or two that have just left? Do you recognize the rare combination of leadership and circumstances that has made the modest developments of the past three years possible? I for one am grateful for them even as I continue to wonder why institutions, colleges, departments, or programs dominated by righteous liberals who write love poems celebrating the nobility of black women voters in Alabama or readily denounce Trump’s racism, need training in bias recognition. If pressed, I would perhaps suggest that it is not training that is needed. On the other hand, bias training and the other mind stuff might be part of the compromise devised by more humble people to get through what even the Comandante en Jefe’s decrees could not. In any case, thank you Bill for providing me with the space and opportunity to comment. I know I must at some point soon get to the exams waiting for me across the room. Your comments on this blog and in our conversations always make me think harder about the wisdom of the economic approach to problem solving. It means a lot to me that you are positive about the improvements at UO in recent years regarding diversity at UO. We could all use some good news. I think moving a few million dollars from DEI administrators to student scholarships and support would create a measurable improvement in the diversity of our Oregon undergrads, and could help lift a hundred or so students out of poverty. Errr, ahem, grades were due Dec. 13. At any rate, the important takeaway from the implicit bias training was that good-looking realtors get better prices for their listings than not-as-good-looking ones. You could hear the faculty chewing on that profitable thought. I’m foolish enough to believe that supporting students from under-represented groups, especially first-gen students that need financial and other kinds of support, would be a good way to tip the scales of unequal power distribution (you know, why there are “diversity” initiatives in the first place). Further consideration of those students’ backgrounds and experiences might illuminate the particular ways our institution might support their particular needs, which both do and do not fall in line with simplistic social categories of identity and belonging. You know, ‘cause who we are, who I am, is kinda complicated? An equally nuanced, and context-specific consideration of hiring practices and department and institutional support for junior faculty might help with attracting and retaining people with diverse backgrounds and dare I say, “diverse” scholarly interests. apt, I think you read the “implicit” mindset here pretty well. Whoever you are, I think we might get along pretty well, if we ever happened to meet and talk. Again, I STRONGLY recommend the engaging research-based short (<20 min) video by Professor Correll of Stanford about understanding and addressing bias in the workplace. This is not just for search committee members, but for all of us on the faculty and staff, as in one way or another we are gate-keepers every day. I agree. The empirical evidence for clearly racist and sexist behavior in student mentoring, hiring, climate, promotion, and pay is overwhelming. (And I thought that was the best part of Erik’s IBT session.) Thanks for these links Jennifer. Maybe we should have mandatory training that focuses on these issues? Thanks for the reference to that very good Stanford video. I liked that it not only provided samples from studies showing that there is bias, but also had specific actions/recommendations for how to structure searches and workplaces to overcome inherent potential for bias. This would apply to racial or disability bias too. Completely off-topic — maybe for another UOM post — but has anyone else noticed how wretched the UO online giving setup has become? If anyone is interested, would be more than happy to explain what I mean. OSU has a really great training, called the Search Advocate Program. It’s coordinated out of Academic Affairs. I think it is something for Senate leadership to check out.